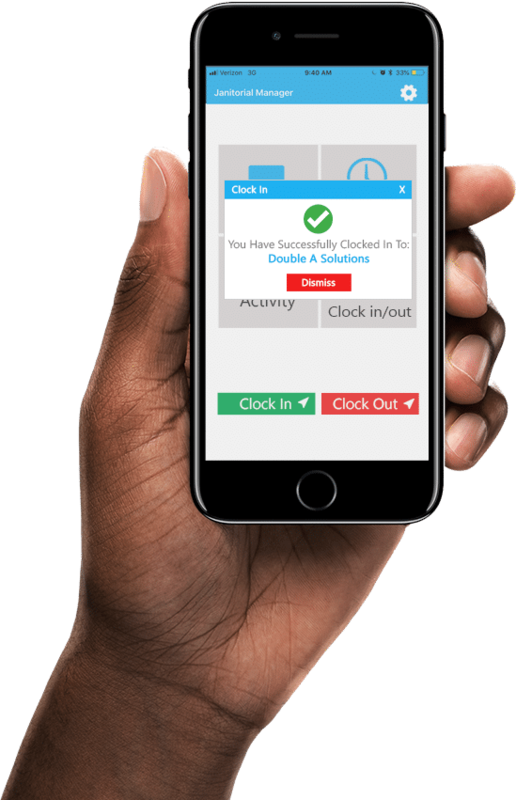 The janitorial time tracking feature in Janitorial Manager allows managers and owners of cleaning companies to save time by automating the clock in and clock out process for their employees. Track Employees’ Time From Any Phone At Any Time. See Who’s At What Location At What Time – In Live Time! There are multiple ways to clock in and clock out of a location in Janitorial Manager. No more guessing or taking an employee’s word for how many hours they’ve worked. Employees should not be able to send texts from their house claiming to be at a work location! With JM or other integrations, like Chronotek, you have the ability to keep better track of your labor expenses so you can accurately meet the margins expected per location cleaned. Janitorial Manager now gives staff members the ability to clock in and out using geolocation. This feature will not allow the employee to check in or out unless they are within the geofence (set by the manager or owner of the company) of the location they are supposed to clean. This feature also gives the manager the ability to track employees’ travel time to each location on their schedule. If a staff member doesn’t have the ability to use their location setting on their phone, there is an option for a manual clock in and out. Easily keep track of whether you are meeting the margins you want per location based on the time it takes to properly clean each location. From your original bid, using the official ISSA 612 time and tasks standards within JM’s ISSA Calculator for Job Bidding, you can judge if your employees are cleaning locations as efficiently as they should be based on the industry standards. Doing this allows management to make decisions to move other employees to that location or re-evaluate the contract with the customer. No more false and unreliable information sent to your phone! The Janitorial Manager janitorial time tracking feature keeps management updated with who failed to show up at a certain location or who didn’t clock out of a certain location. We like to keep management notified of the happenings in their organization, which in turn helps keep your customers happy! With Janitorial Manager, management can see where employees are struggling. Employees could be having trouble arriving on time to locations or just taking too long to complete tasks. Using the JM janitorial time tracking feature gives you the ability to coach your staff based on real results from the field.